Throughout the period of developing Ixion, my multi-dimensional perception continued to expand. The way I explain this is like adding stations on your radio receiver that you can select and tune in to—in truth, the full data stream is always there but we have only trained our minds to pay attention to certain "stations." I developed the ability to tap into a range of new stations. My private practice also continued to change. As I worked with my clients I perceived more and more of the negative field imprints and thought forms that were affecting them. I developed Radiant Touch Therapy to balance my clients' meridian and chakra energies and Ixion Radiance Integrations to reset the deeper archetypal patterns. I also started making drawings for my clients to take home that encoded keys for them to work with between sessions. Sometimes these drawings were "mazes" through which they could integrate alienated parts of themselves. Sometimes they were a resonant image of an inner personality archetype that needed greater expression. Other times they encoded different challenges and important milestones for my clients' development. While I enjoyed making the custom drawings for individual clients (and still do) I believed that, after literally thousands of hours of working in the fields to correct certain dysfunctional dynamics, I was capable of making design matrices that could address a core set of dynamics with respect to more general issues, such as being able to pursue and achieve a goal. By this time I had many notebooks full of field-encoded drawings applicable to a range of issues (see Gallery) and I had developed a number of different presentations of the information. Most of my drawings up until this time had been freehand, and some were done with protractors. 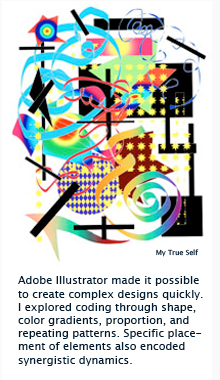 Learning to use Illustrator, a software program that allowed me to make precise yet complex lines and shapes with color gradients easily, allowed me to develop images that had a whole new order of functionality and sophistication. I could move designs around easily and begin to configure a synergistic matrix. In addition, learning Photoshop let me add yet another level of visual effects, and allowed me to create even more greatly nuanced code. In 2007 I produced six lightware images, called Quantum Radiance Lightware at the time. These were 10" x 14" color illustrations that were laminated for durability. If you attended a Body Mind Spirit Expo in Chicago or Milwaukee between 2007 and 2009 we may have met. It wasn't long, however, before I began thinking about how I could use the internet not only to make the images easily available (and ecologically green), but I could also make them interactive. This of course required learning more software, but adding interactivity into the mix gave me a chance to significantly upgrade all the lightware panels. It also gave me the opportunity to greatly expand the code and create a number of different interactive components within a given panel that would both enhance its function and the number of dimensional subtle bodies the panel resonated with. Upgrading to the internet encompassed much more than just upgrading the initial six lightware panels. Aliess joined me on the project out of her commitment and excitement to help people shine their brightest light. We began to look at what we could provide together and what structures we needed to fulfill on that vision. With that in mind I developed the Awareness Pathway and the Chakra Pathway, adding the Thematic Pathways as a way to give even more in-depth online coaching. Aliess began thinking about how she could offer support through webinars and live events. She looks forward to connecting with you and supporting you with your goals. We are both thrilled to serve your growth and have the opportunity to be on the path with you.